The boys’ team played a challenge match against St. Declan’s Ashbourne in Ashbourne this week, thirty-one pupils travelled. 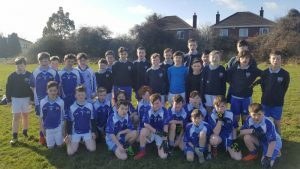 The format decided upon was a first half made up of 5th and 4th class pupils and a second half made up of 6th and 5th class pupils. All the lads got a half of football which was a great way to get started and to reward them all for their effort in training. The league competition begins later this year.